Students will examine Rodeo-Pickup Man and use clues to determine the elements of story structure apparent in the painting, paying particular attention to setting. Students will then create a setting for a story of their own. establish a setting in a personal story. Show students Rodeo-Pickup Man and have them describe what they see. Ask them to tell you the first thing they noticed. How many people do they see? How many animals, and what kind? What is going on in the painting? Where does the scene in the painting take place? How can they tell? Once they have looked at the image for a while, ask them if there is anything they notice that they did not see before. What? Share with students information from the About the Art section as appropriate. Locate the details listed in the “Details” section in the painting. Point out that art can tell a story just like a book can. Remind students that the main elements of a story are plot, characters, and setting. Ask students to identify these elements in the painting. Explain to students that Mechau believed that, “America is the place for American painters.” He also believed that the American West was the best possible subject matter for his art. Explain that this tells us that setting is a very important element in his painting. Have students work in partners to describe the setting painted in Rodeo-Pickup Man. What clues tell us about the setting? Could this image of an American rodeo take place in a different setting? Would it work well? Ask students to think about and discuss how important this setting is to the telling of the story in the painting. Instruct students to think of something important that has happened in their life. Tell them to imagine that they are going to write a story about that event and ask them to focus on the setting of their story. Where did their story happen? Remind them that the setting helps the reader imagine the story, so it is very important to include a lot of detail in the description of the setting. For instance, if they were telling a story about when they learned to ride a bike, they might want to explain whether they were on a road, in a driveway, in a parking lot, or on their front sidewalk. Ask students what details they will include to enable the reader to visualize the location? What time of day was it? What was the weather like? Instruct students to write a description of the setting of their story after thinking about it carefully. Tell students to turn to a partner and take turns reading their descriptions. While their partner is reading, they should close their eyes and try to visualize the setting based on what they hear. When their partner is finished reading, they should try to guess the setting of the story. Did they get it right? If not, prompt students to think of what clues they might add to better describe the setting. Younger students could draw the setting of their story rather than write it. In partners, they can describe their drawing without telling the listener exactly where it is located. Students will examine Rodeo-Pickup Man and find information that allows them to compare and contrast the roles of people who provide safety across cultures and throughout different time periods. 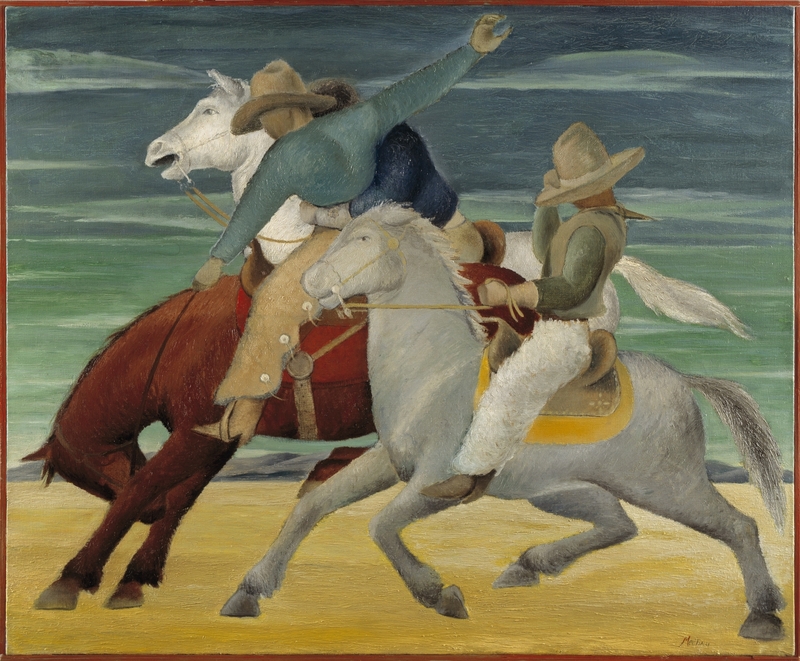 In this lesson children will investigate elements of Rodeo-Pickup Man and participate in activities related to the painting. They will explore sound, color, and their imaginations; and will make their own paintings to share with the class. Students will identify and describe details in William R. Leigh’s painting Greased Lightning, then choose appropriate vocabulary words to write Mad Lib stories about what may (or may not!) be happening in the painting. Students will examine and discuss Rabbit Hunt by E. Martin Hennings and use clues from the painting to identify place, landscape, culture, and any other information describing the region depicted in the work. Students will examine the visual tools used in the painting Road to Santa Fe and how those tools help the painter tell a particular story. They will then use the painting to explore storytelling and use brainstorming strategies to enrich the content and voice of stories they will write. Frank Mechau [MAY-show] was born in 1904 and grew up in Glenwood Springs, Colorado. He worked for the railroad and as a cattle hand, and later received a boxing scholarship at the University of Denver, which helped finance his art studies. After traveling to Europe to study art, Mechau returned to Colorado. “America is the place for American artists,” he said. Mechau taught art at various places in Colorado, including his own Mechau School of Modern Art in downtown Denver. In 1934, he received his first of many government commissions to create murals (his first mural is located in the Denver Public Library). Mechau settled with his family in Redstone, Colorado, in 1937, where he continued to teach and paint. He died suddenly at the age of 42. Mechau was well-recognized as a mural painter and has either murals or paintings in 48 states. He worked very slowly, with painstaking precision. Using countless sketches, he recomposed and resized his forms many times. Mechau’s representation of the West combined traditional subjects with simplified forms and a modern style. Mechau felt that the West held the best possible subject matter for his art. “Sports, mountains, canyons and the history of the West, of which Colorado has more than her share, are subjects from which I hope to fashion [my art],” he said. This painting has a Colorado setting, with mountains along the horizon. Mechau was also inspired by the energy and beauty of horses, a common source of dynamic form and movement in his paintings. While studying in Paris, Mechau was influenced by cubism, with its simplified, geometric shapes, and by artists like Picasso. For his own works, Mechau took cues from his studies in Europe and the many hours he spent scouring museums. Vibrant colors, which he may have admired in works of European art from the 1200s, along with strong, clean lines, influenced by Chinese and Japanese paintings, help express Mechau’s great adoration for the West. Mechau loved horses and spent a lot of time observing them and making sketches, trying to capture their spirit and beauty. Notice that there are no facial features shown on any of the riders. Mechau created much more definition for the horses’ faces than those of their riders. A quick leg count reveals how Mechau manipulated his subjects, overlapping figures to read as one form. While the gray and brown horses seem to have all of their legs, the white horse’s legs are not shown. Mechau created smooth lines by combining the edges of his forms. Notice how he positioned the cowboy boots so they fall inside the shape of the horse. To put more emphasis on the horses, the shirts of the riders blend in with the sky. A triangle of the primary colors is displayed with the red and yellow saddle blankets of the horses and the blue shirt on the third rider. A touch of the same red from one saddle blanket is used to highlight the artist’s signature at the bottom. Shapes and lines repeat throughout the painting. Wispy horizontals define the scarf, clouds, and horse tail. Circles are repeated on the chap buttons, horse bit, and bridle joint. Looking closely, you can see different textures Mechau created with the paint. The ground looks rough in comparison to the sky because the paint is thicker. The tail looks hairy, the horse’s body seems furry, and the chaps appear fluffy. Although Mechau simplified his forms, he also included some small details. While the body of one rider is almost completely hidden, you can see his arm, wrapped around another rider, with a tiny flower on his cuff. Other small details include fringes on the brown chaps and a star on one of the saddles.